We are proud to announce our next Cabaret & Quiz Night. Presenting SATURDAY NIGHT LIVE! 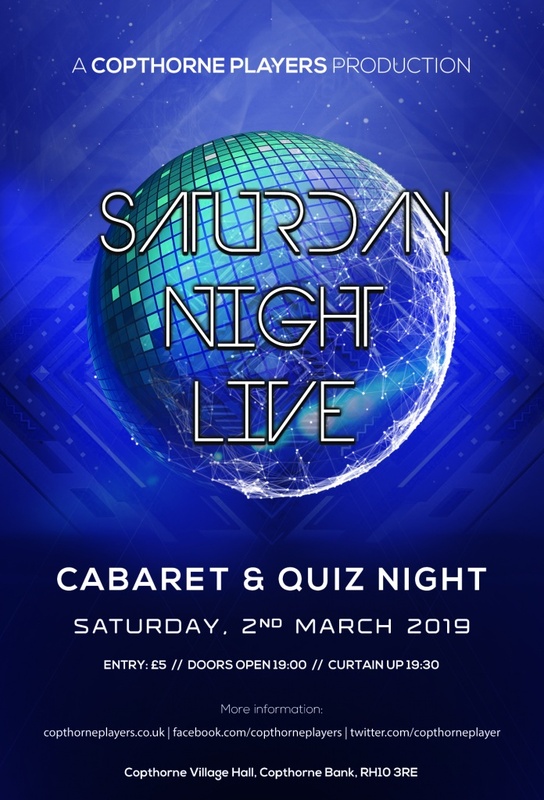 Taking place on 2nd March 2019 at Copthorne Village Hall, join us for an evening of cabaret variety performances followed by one of our famous quizzes. Doors open at 19:00 with performances starting from 19:30. Been singing that song in the shower but not sure if you’d ever have the opportunity to perform it on a stage? Got a secret talent that you’re now ready to share with the world? Dance like nobody’s watching in your living room but now you’d like people to see your incredible moves? Well here is your opportunity! We’re looking for performers to join us for this one-off cabaret evening like no other. Register your interest by emailing hello@copthorneplayers.co.uk with details of your act and we’ll get back to you ASAP. Performing not your thing? That’s okay too – we’re also looking for some enthusiastic audience members! Entrance fee collected on arrival with entry on a first come, first served basis. Been thinking of joining Copthorne Players but not had the opportunity to come meet us yet? Most of the committee will be there along with a lot of our membership. We’d LOVE to meet you. Come along!